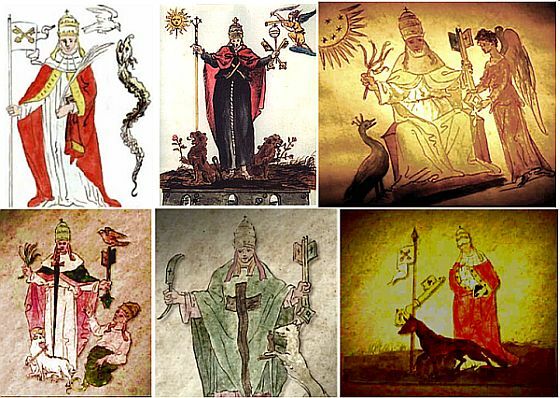 The symbolic of consciousness reveals mystery of Nostradamus aquarelles. It is considered that Nostradamus part of his predictions had presented in his pictures. Even a cursory glance through the pages with drawings of Nostradamus is enough to understand – all the information in them is presented by symbolic of consciousness. Serpent is the symbol of cataclysms. In his drawings, Nostradamus warns about the occurrence of global cataclysms of incredible force of the planet' destruction that erase from the face of the earth not only mankind, but also organic nature. In accordance with the symbols of consciousness Nostradamus depicts global cataclysms in the form writhing bodies of serpents or dragons. However, before their beginning during one year will happen three preliminary cataclysms of incredible strength. One of them will occur as a result of the fault of two tectonic plates in the period of the zodiac sign Cancer, i.e. from June 22 to July 22. As a result, on the planet will arise high level of radiation. Nostradamus indicates that the reason for cataclysms beginning is the changes of processes on the Sun, as well as the activation of the movement of tectonic plates of the planet. Mankind has to leave the level of the Crystal structure of the material world, where will rage cataclysms. It is necessary to make the Transition on another safe Highest level of the material world into the harmony of the same planet Earth, where there are no cataclysms. In the new cycle of life humanity will become immortal. This is the only way out. The Instructions for the Transition. Mankind has never traveled through parallel worlds of the material world yet, and does not know how to do it. The Instructions for humanity's Transition to another level of the material world were transferred from the Above and are written in symbols of consciousness. For reading of these Instructions were transferred from the Above also the two keys revealing the basics of symbolic of consciousness. The Woman –the direct descendant of King David had received the Instructions for the Transition, and two keys for their reading. In his pictures Nostradamus reports that two keys for decoding and reading the Instructions for the Transition will be given from the Above to the Woman with complete knowledge about this event. Nostradamus also informs that this Woman is the direct descendant of King David, the creator of the Psalms, because the mother of this Woman is the only one his reincarnation. This Woman has the sister, who helps her to receive and decode information from the Above. Thus, two sisters are the direct descendants of King David. Nostradamus indicates the date of birth of the Woman, to whom are given the keys – she was born in the year of the Ox under the zodiac sign of Libra. Nostradamus gives also some other features of two sisters, for better identification. So, in his pictures Nostradamus reveals two people, the direct descendants of King David, who were entrusted from the Above to transfer the Instructions for humanity's Transition to the Highest level of the material world for continuation of life, as well as two keys for reading symbolic of consciousness in which these Instructions are written. The keys to the kingdom of heaven real and symbolic. Nostradamus also informed that the keys of the kingdom of heaven, which were given to the Apostle Peter, and then passed from one Pope to another, are only symbolic. For thousands of years the keys constantly reminded mankind that in the day of mortal danger, humanity could be saved in the kingdom of heaven. However, on the eve of global cataclysms these two symbolic keys were replaced from the Above by the two real keys, which had been given together with the Instructions, written in symbols of consciousness, for the Transition of humanity on the Highest level of the material world – in the kingdom of heaven. These two keys to the symbols of consciousness allowed to read and understand the Instructions for the Transition. Therefore, in many pictures Nostradamus depicts the same Woman – the direct descendant of King David with the tiara on her head, because the tiara indicates that this person has the keys to the kingdom of heaven. Humanity has to be necessarily informed about replacement from the Above of the keys – symbolic on the real. On the eve of start of global cataclysms of the planet’ destruction humanity has firmly know that now all of us have real keys to the kingdom of heaven for the salvation. However, the main thing is that we have the Instructions which explain in details how to get into the kingdom of heaven – how to make the Transition to this place. Two levels of consciousness – to create the laser beam of incredible strength. In order to make the Transition humanity has simultaneously to unite consciousness with a common goal. In this process have to be involved two levels of consciousness. The first level of consciousness is the highest consciousness of righteous people, who dedicated their life to the prayer. The righteous people will spark separate laser beams as igniters. The united consciousness of civilization has to incredibly amplify them and create the uniform laser beam of improbable force. The laser beam will destroy our bodies at the level of the Crystal structures. The General resurrection. At the same moment, humanity will arise again at the Highest level of the material world – in the kingdom of heaven. This way will happen the General resurrection and renewal humanity will start the new cycle of life – the cycle of Correction and will gain immortality. In the new cycle of life will be only two categories – hell or paradise, and everyone will be responsible for the decisions and actions that he makes today. Thus, our bodies will be holographic without injuries and diseases, as stated in the Holy Scriptures. Together with us will make the Transition also three previous levels of consciousness included in our cells of individual consciousness. Strengthening of the laser beam is the most important stage of the Transition. The most important stage of the Transition is strengthening of the action of the united consciousness of humanity. For this purpose the civilization needs to create homogeneously-resonant structure of the united consciousness. The main obstacle for the Transition. However, just at this stage arises an unknown to mankind the main obstacle for the Transition connected with carbon nature of humanity. Carbon basis of humanity is manifested primarily in very broad and super stiff boundaries of individual cells, which are very difficult to soften. Properties of cell’ boundaries are revealed in a deep heart rigidity of civilization, hate, wars, lack of understanding. Just about this danger for the Transition warns the so-called Number of the Beast 666, the apocalyptic and the human, which was decoded by us through symbols of consciousness on the eve of global cataclysms. Revolution of consciousness for the Transition – from wars to love. For creation of homogeneous-resonant structure of the united consciousness it is necessary to form a single cell. However, the broad cells boundaries do not permit to do it. Humanity can overcome its nature only consciously – by turning over the mind from hate to love, and mutual understanding. Nostradamus informs that for the Transition of humanity has to turn over consciousness and change the basis of relations according the Golden Rule or ethic of reciprocity – Love your neighbor as yourself, which is known from ancient times in religious and philosophical teachings of the East and the West and lays in the basis of many world religions, ancient philosophy and is a fundamental ethical principle (Wikipedia). Only love can melt the boundaries of individual cells of civilization, so they merge together and cause the laser beam. This way will happen an incredible amplifying of the laser beam which portrays the image of the Lion. So, the resulting incredible powerful laser beam will cover the whole united cell of humanity and will destroy our bodies at the level of the Crystal structures for the General resurrection and the continuation of life in the new cycle. Only this way can be created homogeneous-resonant structure of the united consciousness. Revolution of consciousness means that for the Transition humanity has to change the regime of consciousness and transform from individual consciousness of war and hate to the united consciousness of understanding and love. For millennia uniform-resonant structure of consciousness of love was formed by the Psalms of David. The incredible importance of the revolution of consciousness from hate to love, as the only possibility of continuation of life of civilization, for millennia constantly points the inverted cross of St. Peter. Nostradamus represents revolution of humanity’ consciousness through flipped upside down image of Big Lion in the picture 35. The basis of the Transition is love. So, for the Transition it is necessary that relationships would be based on love. Love is the original condition for unification of consciousness of humanity. This is the most important and necessary condition for the Transition. Failure ofthe condition. If humanity does not follow the Instructions and not form homogeneous-resonant structure of consciousness for the arising of the laser beam of incredible strength, then our bodies will remain at the level of the Crystal structure. In this case, the civilization of Earth will be destroyed with the beginning of global cataclysms. The Transition before the second pre-cataclysm. Moreover, it is necessary to make the Transition before the second preliminary cataclysm, because it will cover huge territory and will bring incredible human losses – about 2 billion of people, and, the most important, on the planet will arise very high level of radiation incompatible with life human and organic nature. After third cataclysm mankind will be destroyed with the beginning of global cataclysms. Three cataclysms will occur during the year. Now it is known that before global cataclysms beginning, as a warning, will occur three preliminary cataclysms of incredible strength as a result of activation of the movement of tectonic plates of the planet. It is known also that they will happen during the year. The dates of the three cataclysms are known – one of them will happen in the period of zodiac sign Cancer, i.e. from June 22 to July 22. Two others will occur at autumn and spring equinoxes. However, yet it is unknown the date of the first of them. The epicenters of all three cataclysms will arise in the ocean. The epicenters of the pre-cataclysms. The epicenter of the cataclysm, which will occur in the period June 22 – July 22 will arise in the region of Greenland-Iceland, and is associated with the fracture of two tectonic plates – the North American and Eurasian. The model of Russian scientist Nikolai Zharvin informs. As the result of the Greenland’ glaciers melting and lift the edge of the plates is formed the tectonic fault, beneath which is located the upper part of the Earth mantle with temperature of 1200ºC. Mass of cold ocean water that gush in the tectonic fault, will get on molten lava of the upper part of the planet’ mantle. This will lead to an explosion of enormous strength, since the water instantly turns into steam, and therefore incredibly extended. Compressed vapor in the form of a huge explosion will escape through the thickness of the ocean and will raise into the stratosphere of the planet on the altitude of about 20 km large amounts of volcanic ash and gas from the Earth’ mantle. The evaporated water will form a huge horrible black cloud, which will be shed on the Earth by extremely heavy rain. During the steam explosion the ocean will be severely indignant and tsunami of a great height will arise. Last year happened an extraordinary event – just in four days from July, 8 to July 12 Greenland’ glaciers melted on 97%, despite the fact that its height in the center of the island is about 3.5 km, and the area is 972,000 sq. km. NASA scientists note that the speed of melting of ice in Greenland was unprecedented. Obviously, such speed of melting is caused by action of ultrahigh temperature which could arise only at the expense of already formed the fracture of tectonic plates. This is the information only about one cataclysm during the period from June 22 to July 22. The first of two cataclysms of incredible force which will occur in the fall or spring equinoxes will have two epicenters. One epicenter will arise in the Pacific Ocean off the coast of Peru in the region of the Brazilian magnetic anomaly at the intersection of two currents – Humboldt and El Niño, and the second – in the area of Mexican Gulf and Yucatan Peninsula, where are joined at once several tectonic plates. The main blow of this preliminary cataclysm will be directed on the East Coast of the USA, as well as the West Coast of Europe. Many other countries also will be subjected to incredibly strong blow. The famous American predictor Edgar Cayce foretold that as a result of natural blow the waters of the Gulf of Mexico in a few minutes will joint with the Great Lakes. High level of radiation on the planet. It is important to note once again that the first cataclysm will destroy many nuclear plants, and on the planet will arise high level of radiation. However, it will be much lower than the level of radiation that will occur after the second preliminary cataclysm. Thus, humanity has already received the Instructions for the Transition and should make the Transition before the second pre-cataclysm. About this difficult severe time Nostradamus informed the following: «common blood will flood the earth, people will live with closed mouths, and unpredictable will come». Unpredictable – is radiation – unknown phenomenon at that time. So, he highlighted that as a result of very strong cataclysm, which will cover huge territories and bring big human losses, will arise high level of radiation, and therefore people could not eat anything. Radiation will close mouths of people. So, today, preparing for future events, it is important to reduce the consumed amount of food and meat. Nostradamus: The world will be saved by the new religion from Russia with different worldview. Nostradamus predicted that will happen «the third flood of human blood.» For those, who survive will begin a new era with a new outlook and a lot of new knowledge. The beginning of a new era will be based in Russia. Salvation of the world, according to Nostradamus, will happen because of the new religion. It will be based on unification of consciousness of civilization and the Golden Rule or ethic of reciprocity. «Love your neighbor as yourself». It will be «a group of philosophers who despise death, honor and wealth». It will be the doctrine that will link together material and spiritual. Edgar Cayce: the hope of the world will come from Russia. 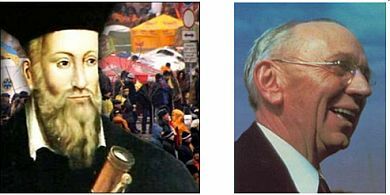 Edgar Cayce – famous sleeping American prophet, just as Nostradamus predicted that in this period of deep despair of humanity, completely tied to the planet which will be destroyed, «the hope of the world will come from Russia. It will be not communism, but a new kind of consciousness, when everyone will be responsible for each other. » This way the great American predictor Edgar Cayce described the united consciousness as the only possibility of continuation of life, the knowledge of which will come from Russia. Through unification of consciousness humanity will make the Transition to the new cycle of life. So, M. Nostradamus and E. Cayce predicted that Russia has a special mission in the world. The content of predictions that Nostradamus presented in drawings, is decoded by the Dictionary of symbols of consciousness, which composed Russian scientists, the authors of this article. Nostradamus warns: slow spreading of information about coming cataclysms and delay of the Transition, as the only way of salvation due to indecision of mankind will lead to destruction of the civilization of Earth. 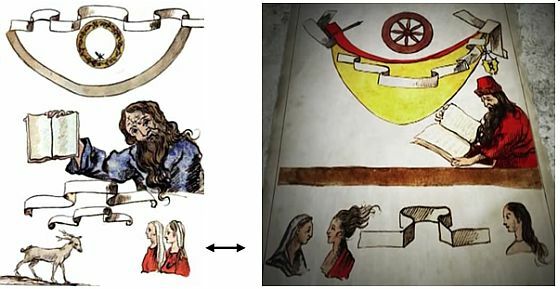 Wheel of Time shows the way of salvation from cataclysms through the Transition.Among numerous Nostradamus' aquarelles stands out separate group of eight drawings with the image of the Wheel of Time. On one of them the Wheel of Time, stopped from the Above, is shown in the center as the major element, surrounded by various figures. Thus is shown a chain of events that reveal the reason of humanity’ Transition and the main stages of the preparation. On all other pictures of this group the Wheel of Time is placed on the top. This way is shown that all these pictures are connected between each other by a single chain of events revealing in details the most important stages of the last period of time before the Transition. Location of the Wheel of Time on the top of pictures means that allbr /img src= span style=/span the causes and events have to lead to the Transition of humanity on the Highest level of the material world. The Transition can be made only through a body transformation. So, the Wheel of Time shows the possibility of salvation from global cataclysms through the Transition to the safe Highest level of the material world. The color of the Wheel of Time, its shape, the location of Information Tapes also complement the information transmitted by the picture. On the example of decoding of several Nostradamus’ drawings, with the help of symbols of consciousness, you will see how easy they can be read. On two Nostradamus’ drawings is depicted Sagittarius. However, one picture shows the Sagittarius with an arrow, and the other – without arrow, because he has already shot it. The picture 69 with the Sagittarius with an arrow indicates the Woman that will transfer to humanity the Instructions received from the Above for continuation of life. The picture 67 with the Sagittarius without arrow reveals the causes, location and time of cataclysm of incredible strength which will bring to mankind huge human losses and high level of radiation. Let’s consider in details each of these pictures. On the picture 69 the Sagittarius with an arrow are shown two naked figures – the Sagittarius and the Woman. It means that the mission of the Sagittarius – to indicate humanity the only person who will reveal all naked barefaced truth – the truth about the events of the End of Time, and give humanity the Instructions for continuation of life received from the Above. This person is the Woman. An Arrow already ready to fly from the drawn bow of Sagittarius, is the arrow-pointer. It is aimed at the Woman who holds the bow of Sagittarius. Bandage, shifted from the eyes of Sagittarius on the forehead indicates that the information transferred by this Woman, will open eyes of Earth people, because this way will be revealed the mystery of events of the Doomsday-the End of the Time-the End of the Cycle. The mission of the Woman – to transfer to people the information from the Above about the beginning of global cataclysms of the planet’ destruction and the Transition of civilization on another safe level of the material world through the united consciousness of humanity, as the only possibility of salvation. The Transition on the safe level is necessary to make as soon as possible - before the second preliminary cataclysm, or else civilization will be destroyed with the first natural blows. The huge massif of the information received by the Woman about future events is shown by a vertical Information Tape of such big length that Nostradamus even rolled it. The Woman in the picture stands in the bend of horizontally placed Information Tape, which wraps her body. Below is shown the same piece of the Tape with the bend which is disclosed down. It means that the information provided below reveals her date of birth. She was born under the Libra zodiac sign (23 September - 22 October) in the year of the Ox. This woman – is Russian scientist Victoria Popova. She was born under the zodiac sign of Libra – 7 October, in the Year of the Ox – 1949. Two keys for reading the Instructions for the Transition. To this woman – Victoria Popova were given from the Above not only the Instructions for the Transition of civilization into the new cycle of life, presented by the symbols of consciousness, but also two keys for reading the Instructions. Symbolic of consciousness is a single alphabet of the universe. Nostradamus shows in his drawings how look these real Keys with symbols of consciousness represented on the heads of Keys for the Transition of humanity in the kingdom of heaven to continue living. He represents the real keys in the picture 27. The crescentunderthe Wheel of Time.Directly under the Wheel of Time in the picture 69, even slightly touching its horns, is shown the crescent of the united consciousness – the main symbol of the Transition – its flag. Crescent of the united consciousness forms also the upper part of the curved Information Tape, which runs down next to hand of the Woman. So briefly transferred the main content of this picture – for continuation of life civilization has to unite consciousness and make the Transition to the safe level of the material world. And drawings of Nostradamus continue to tell more. The picture reveals the origin of the Woman whom are given from the Above the Keys for reading the Instructions for the Transition of humanity into the new cycle of life. The upper part of the picture. In the upper part of the picture, including wide brown dividing line, are depicted the Wheel of Time, golden Crescent with the Information Tape, and the Man with a long beard and a book in his hands. Crescent of civilization’ united consciousness.In the center of the picture under the Wheel of Time is shown a huge golden Crescent of the united consciousness of civilization. This is indicated by the huge size of the crescent, as well as long Information Tape with bilateral folds shown on its background. This Tape is usually placed under the Wheel of Time and Events. The Tape is positioned so that its side with closed for Humanity information is turned towards the Crescent, and this closed information is disclosed on the Crescent. So, the form and content of the Crescent reveals this closed information. This shows that the Crescent – is the main task of mankind of Earth, the purpose of his existence on the planet: to form the united consciousness of civilization. Double-sided fold on the Tape reveal the Principle of the united consciousness. The Crescent of the united consciousness of civilization is the main symbol of humanity's Transition to the Highest level of the material world in the next cycle of life – it is the Flag of civilization’ Transition. Gold color of the Crescent, as always, means that the information about this symbol and connected with it concepts is given from the Above. King David. On the right, just below the crescent in red clothes and hat, with scribbled Book in his hands, is represented King David – the Psalmist – one of the greatest personalities of biblical history. A broad band of brown color – the color of the Earth, which covers the lower part of his body, and which slightly touches his hand, means that this is the man of the Earth. On the other hand, this band divides the picture and transferred information into two parts – upper and lower. Huge massif of information which received King David from the Above, is presented by white Information Tape of extraordinary high quality and beauty – with bilateral running of folds, extremely length. It is depicted on the background of a huge golden Crescent. This way is shown that the whole vast massif of information, which received King David from the Above is about the united consciousness. The Tape, is turned in such way that its entire content is closed to people, but the main idea, which is transmitted through King David, is presented in the form of a huge Crescent of the united consciousness. Besides, the upper edge of a huge golden Crescent is painted in red color. This way is shown that unification of consciousness of Earth civilization is the main, red idea, the basis of the information transferred to King David from the Above. Red color of the clothes and headdress of King David emphasizes his full belonging to this information about the unification of consciousness. This information about unification of consciousness of humanity, King David presented in the book opened in front of him, which he holds in his hands. These are the Psalms of David, written by inspiration from the Above, which for nearly three millennia formed the platform of the Transition – homogeneous-resonant structure of consciousness of Earth’ humanity on the base of great love to the Creator. So, to King David belongs a large and important part of Complete Information Tape, describing all life cycle of humanity in the cycle of Consciousness on Earth, which is wound with the long Screws, shown on the left. Pennant banner over the head of King David. Over the head of King David is depicted pennant-banner (banner-flag) of gold color, which is attached to the Information Tape. Gold color, as always, means that the information that he transfers is received from the Above. Banner hangs on two ropes, tied with three loops. On the banner are depicted three main symbols of the united consciousness (from top to bottom): the crescent of the united consciousness, expanded brain area of the cell of the united consciousness as a large circle, and also the symbol of the unification of two individual cells into one cell of the united consciousness in the form of letter А. In this case the Banner represents a label that briefly gives the content of the information about the unification of civilization’ consciousness represented in the Tape. The form of the banner is completely composed by symbols of the united consciousness. Thus, two small circles at the bottom of the banner (blue color) represent two small brain areas of individual cells, i.e. two people. They are attached to the extensions on both sides, which mean that brain areas of cells have expanded as a result of combining consciousness. Besides, lateral faces of the extensions with two bends curves represent unification of two pairs of individual cells – a pair on each side – are shown in green color. In addition, the top line of the banner is part of a large circle. This circle touches from both sides the banner, other two circles of smaller diameter. This way is shown the unification of consciousness of two people and the expansion of the brain area – three circles of pink-blue color at the top of the banner. Two strings by which the banner is attached to the Information Tape, depict shifts of brain areas in two individual cells at the unification of consciousness. Three loops on which are tied strings of the banner – two small horizontal and one large vertical – also reveal the Principle of united consciousness – at the unification of two individual cells with small brain areas is formed one united cell with expanded brain area. The shape of loops in the form of oval is a symbol of the body transformation for teleportation and the Transition. So, three main symbol of the united consciousness on the banner, its form and two strings on which it hangs, inform about the formation of the united consciousness. This story had completed three loops-ovals – symbols of body transformation for teleportation flights and the Transition. Consequently, banner informs that the unification of consciousness of civilization will cause a body transformation and the Transition to the next cycle of life. Conclusions on the top part of the picture. The upper part of the picture transfers that the main information about the unification of consciousness was given to mankind from the Above already very, very long time ago. For a long time consciousness of humanity was perfecting in this direction and at the end of the cycle of Consciousness it is completely prepared to unite consciousness and to make the Transition to the next cycle of life. Thus, the Transition and the resurrection are the main stages of continuation of human life. Besides, thick long beard of King David informs that he lived and worked a long time ago and a lot of time has passed since then... Wide brown line also informs that between the top and bottom parts of the picture has passed a long time. The lower part of the picture. In the lower part of the picture, under broad brown line are depicted three Women. One of them is shown directly below King David in the right side of the picture. The two other Women on the left side are facing each other and are shown on the same level with her, but not close and through the Information Tape. One of them is blonde and the other –dark-haired. The only reincarnation of King David – into the woman. Depicting the Woman under King David, Nostradamus, thus, indicated the only one reincarnation of King David – into the woman. Long beard of King David as if transforms to long hair of the Woman, indicating that this is single and very ancient line. Long hair behind the woman means that behind her is very old relationship – between their lives is a huge amount of time – about three thousand years, and this is his first and only reincarnation. Zinaida is the name of the Woman, of just one reincarnation of King David. Just as David she is of medium height with broad shoulders, curly golden hair, blush on cheeks, extraordinary eloquence and beautiful style of speech, great musical ability, sniper accuracy. Her delicate features, golden curly hair and body proportions are similar to the image of David created by Michelangelo in Rome, which reflected even crook on the nose. Even today, in her 94 years her delicate features reflect not only beauty, but also roots. Zinaida – is the deepest righteous. All deficiencies that must be corrected in accordance with the commandments, are not simply missing in her - they, were as if, burned out by a hot iron long ago. Just as King David, Zinaida lost her firstborn son who did not live up to two and a half years. At the same time, long before the event, her mother was told from the Above that the child will die, though the boy grew very strong, healthy and happy. Her two daughters – the direct descendants of King David. Thus, the Woman on the right side is the only reincarnation of King David. On one level with her through the Information Tape are shown two Women facing each other. In this case, the Information Tape is turned inside to the viewer. It means that in this place the Tape reveals humanity from the Above very important relationship between the elements of the picture, details of which had previously been a deep mystery for people. Thus, the two Women depicted through the Information Tape from the woman on the right side – are her two daughters, and she is their mother. Consequently, both daughters are the direct descendants of King David. These two Women are two sisters, two Russian scientists, they constantly discuss with each other new, incoming from the Above information. Blonde Woman is Victoria Popova and dark-haired Woman – Lidia Andrianova. The picture also shows that one of the daughters with dark hair – is shown through the Tape close to mother, is very similar to her. On the picture mother and similar to her daughter – two faces in profile, turned to one side. The head of another daughter is covered with long white shawl. This means that she receives the information from the Above and together with her sister they study and discuss it. This information is about the Transition of humanity into the next cycle of life. That is why the woman with dark hair, is covered with red robe, and her raised hair remind bird’ feathers. Pejs near her ear in the shape of crescent is pointing on the unification of consciousness with the information transferred by her sister. King David and information about the Transition. Nostradamus reports that the highest knowledge about the techniques of the Transitions can be received only by the direct descendants of King David, who laid necessary for the Transition foundations of the united consciousness in his Psalms. To obtain this knowledge, consciousness of King David was immersed in the deep layers of the information world. However, each time a deeper immersion of consciousness was accompanied by a corresponding transformation in his body. As a result of immersion his bones had more and more reabsorbed as a major element of imperfections. Since David accepted an enormous amount of information, his bones were not just thinned, but became hollow, like waterfowl bird. Receiving from the Above information about the Transition, its laws and accompanying it necessary conditions as continuation and expansion of knowledge about the united consciousness of humanity, require even deeper immersion into the information layers. To receive this information, a person must have hollow bones of King David, with spaces filled with bone tissue of a different nature, which would be dissolved layer by layer with each immersion. And also, prepared for the work a certain level of consciousness improvement. This is the reason that receive the information from the Above about humanity’ Transition, could only a direct descendant of King David. Thus, only certain features of a direct descendant of King David, specially prepared for this work, allowed making immersion of his consciousness in very deep information layers for receiving highest knowledge about the technique of the Transition. Conclusion. In his drawings Nostradamus reports that receive and read given from the Above the Instructions for humanity’ Transition with given also from the Above two keys to symbols of consciousness, by which are written the Instructions, will be entrusted to a special people. Nostradamus tells about the origin of these people, showing that they are direct descendants of King David, as well as indicating some of their external features for more precise identification. It turned out that these are the two Russian scientists – Victoria Popova and her sister Lidia Andrianova. Only these special people are able to receive without mistakes vital information for humanity and understand it correctly. Nostradamus also indicates the date of birth of one of them, whom were given two keys to the symbolic of consciousness. This is Victoria Popova, born in the Year of the Ox under zodiac sign of Libra. 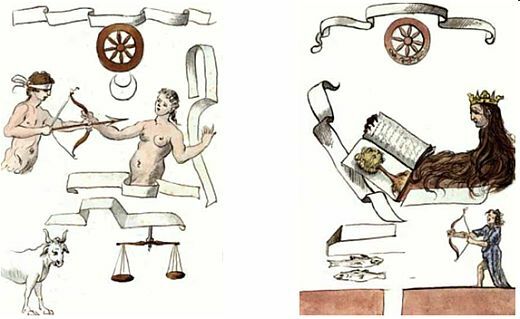 The two women had composed the Dictionary of symbols of consciousness, which allowed to reveal the content of the predictions that Nostradamus presented in his drawings. The same two Women – light and dark-haired, as in the picture 91, are shown in red robes and with white shawls on their heads. This means that both Women receive the information from the Above. This information is about the necessity to unite consciousness of civilization for the Transition and the General resurrection of humanity on the Highest level of the material world in the new cycle of life with holographic body of huge dimensions. Life in the new cycle will start with a clean sheet, which shows big Man in blue dress. The picture is read from bottom to top. The presented information abstractly can be divided into three parts. At the bottom part are shown the same two Women, as in the Picture 91, who received a new knowledge from the Above. This information is transferred by white shawls over their heads, as well as the Deer, that is walking toward them. In the upper part of the picture is reported that they receive the information about the necessity to unite consciousness of civilization for the Transition on the Highest level of the material world due to the beginning of global cataclysms. In the middle part of the picture is shown that as a result of the Transition will occur the General resurrection on the Highest level, and renewed humanity with holographic body of huge size will begin a new cycle of life with a clean page. This information transfers a Man in blue dress, who is holding an open Book of life with blank pages. Two women in red robes. In the lower part of the picture are shown the two Women – light and dark-haired in red robes, with heads covered by white shawls. Towards to them by the ground is coming the Deer. The earth is shown only under the Deer. Under the Women there is no earth. This way is shown that they are completely immersed in the information world, indicated by red color of their clothes, and transmit the knowledge to people. The Deer is a symbol of the new knowledge of renewing, revival. Because of the similarity of deer’ antlers with the tree branches, the image of deer is associated with the Tree of Life. The deer is considered to be a mediator between heaven and earth, the messenger of God. Deer is also shown in another picture of Nostradamus, where under the belly of the Deer is placed the symbol of the Transition, which is presented in many other of his drawings. The symbol of the Transition reminds the heraldic lily –fleur-de-lis and consists of two uniting cells which form two crescents and also the four-side rhombus, presenting the information cell' brain area of a human being of the fourth level of consciousness. The three expansions at the bottom represent three previous levels of consciousness, entering into individual cell of each human. Location of the symbol of the Transition of under the belly – of the most vulnerable place of an animal – indicates on vital importance of the Transition for humanity. The Knowledge about the Transition and the General resurrection. The upper and middle parts of the picture include upper Information Tape and the Man in blue robe. They disclose, what kind of new knowledge, receive the Women. It turns out that the Women received from the Above the new knowledge about humanity's Transition into the next cycle of life, as well as the principle of the Transition from the level of the Crystal structures, where humanity lives today to the Highest level of the material world, where the General resurrection will happen. Let’s consider this information in details with the elements of the picture that it reveals. The Man in blue dress with the Book with blank pages. In the central part of the picture, directly above the Women, is shown the Man of huge size in blue dress, that demonstrates the open book with clean pages in his right hand. The right hand is considered to be the main work hand of a human being, and displays the skills and experience in life. Therefore, clean pages of the thick Book indicate that humanity will begin the new cycle of life with a blank page. On the other Nostradamus picture 65 also is shown the book with blank pages and two crossed keys. Picture 65. Keys to the new cycle of life. Crossed keys represent the keys to the kingdom of heaven, which were transferred to St. Peter. Crossed keys are a symbol of liberation and the transition from one life cycle to another. A book with blank pages means the beginning of a new cycle of human life. The lamp at the bottom is not light up, because humanity lives in the individual mode of consciousness. The heads of the two keys, each of which depicts three levels of consciousness, included in the human cell, and also reveal the principle of the united consciousness, inform that the united consciousness of humanity will light up the torch of the Transition. Significant increase in body size and clean pages. About increase size of the image indicate, first of all, two Information Tapes arranged one above the other. In this case, the lower Tape represents the scale of the lower part of the picture with the Deer and two Women, who are the representatives of the level of the Crystal structures, where we now live. The upper, much greater Information Tape, on which rests the hand of the huge Man and which touches his blue clothes, points on the increase body size on other, the Highest level of the material world, where people will have a holographic body of enormous size. Therefore, Nostradamus informed about a significant increase in body size. It means that the Transition and the General resurrection of humanity on the Highest level of the material world in the new cycle of life had already happened. This is indicated by the blue color of clothes of the Man and blank pages of the open book, which he demonstrates to us. Blue color of clothing informs that the new cycle of life will take place on the other – the Highest level of the material world. Significant increase of a body size in the General resurrection of humanity on the Highest level of the material world is also shown in other Nostradamus picture 30. «The Resurrection». Naked Man of huge height in the blue loincloth is sitting on the dais, pointing with his left hand on his Cap with the Wreath on his head, which represent the cell of the united consciousness. The same Man, but in today's life at the level of the Crystal structures is shown near to him – however, yet he is still of small height and wear clothes, but already in the Cap with the Wreath on his head, i.e. he is already ready to unite consciousness for the Transition in the new cycle of life. The General resurrection of humanity and significant increase in body size at the Highest level of the material world clearly demonstrate the huge five-meters Atlantes, installed on top of the main pyramid of Quetzalcoatl in the Mexican complex Tula. Symbols of the united consciousness. Curls in the hair and the beard, on the one hand, represent the symbols of the united consciousness – crescents, uniting cells. On the other hand, long hair and beard inform about very long life of mankind in the new cycle. Crosses on the forehead and the era of immortality. Crosses on the Man’ forehead in blue robe indicate that the old crystalline body will be destroyed and after the General resurrection of humanity on the Нighest level of the material world will begin the era of immortality. 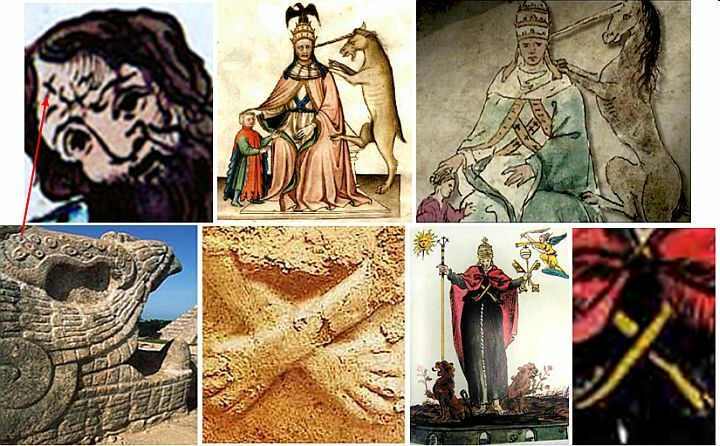 Crosses of a body destruction at the Transition to the new cycle of life are depicted also in other Nostradamus pictures, as well as in many pictograms of extraterrestrial civilizations around the world. These are, for example, the crosses on the Serpent's head in the Mexican complex Chichen Itza and the Crossed Arms in the Peruvian temple. The Information Tape on the top. The two Women received from the Above also the Principle of humanity's Transition into the new cycle of life, which is represented in the upper part of the picture and by bends of the Information Tape. The Information Tape, turned to the observer, means that in this picture to mankind is revealed an important part of the knowledge, which was stored in deep mystery. The Information Tape consists of two parts – the horizontal part with three bends, and also the hanging part of the Tape connecting two ends of the horizontal section. The horizontal part of the Information Tape. Three bends of the horizontal part of the Tape, opened in one side – to the observer – one large bend in the center and two smaller, located on either side from the large, represent the brain areas of information cells. They reveal the Principle of the united consciousness – at unification of consciousness of two people – of two individual cells with small brain areas – is formed one unified cell of the united consciousness with expanded brain area. Hence, the big bend in the center depicts the expanded brain area of the cell of the united consciousness, and two small bends on the sides – small brain areas of cells of individual consciousness. The Ring with ornament – the Crown of the Transition. Under the central bend of the Tape Nostradamus showed the image of the united cell of civilization in the form of a ring, covered with ornament of flowers – it is the Crown of the Transition. The width of the ring, covered with the ornament, depicts a border of the cell, and the bright mid represents the expanded brain area of the cell due to the unification of consciousness of huge number of people. Light yellow-green color of the cell means color of awakening life in spring. In the picture of Nostradamus «The Resurrection» the same Crown is depicted as caps that cover the head of both Men. The two planes of action – horizontal and vertical. In order to highlight quantitative-qualitative transformations, which happen in the structure of human consciousness during the formation of the united cell of Earth civilization with a huge brain area, Nostradamus attached the hanging down part of the Tape to both ends of horizontal Tape. As a result, horizontal part of the Tape represents the Principle of united consciousness and informs about consistent unification of consciousness of more and more people. Besides, the horizontal part of the Tape contains five bends in both directions – the number «five» means the fifth level of consciousness – the united consciousness. A huge brain area of the united cell of Earth civilization, as a result, is shown in the perpendicular plane by hanging down part of the Tape. This way Nostradamus showed that the process of unification of consciousness and joining of growing number of people will pass in the same plane – on the level of the Crystal structures. By achievement of the critical size of the brain area of the united cell, and also at the creation of certain conditions – homogeneous-resonant media of consciousness – in the huge brain area of the united cell will act other laws – in vertical plane. They will allow humanity to make the Transition to another level of the material world. In fact, synchronous unification of humanity consciousness has to create homogeneous-resonance environment in which will arise and will be incredibly amplified the laser beam which will destroy a body for the General resurrection at the Highest level of the material world. Thus, humanity will make the Transition to the Highest level of the material world. About the formation of the united consciousness in the form of the laser beam informs other picture of Nostradamus – «The Hand with the Sword», which will be considered in the third part. The Star of the Transition. Inside the ring of the united cell with expanded brain area – «The Crown of the Transition» – at the bottom is depicted the six-pointed Star. Number six, corresponds to the number of carbon in the table of the chemical elements of D. I. Mendeleev, which point on carbon as the basis of human life. However, this Star is not quite usual and appeared here not by chance. This is the star of the Transition. It has five rays, and instead of the sixth ray is shown an oval of teleportation and the Transition, which is formed by deep unification of consciousness of people, as a result of the overlap of the brain areas of information cells. Five rays indicate on the fifth level of consciousness – the united consciousness, and the symbol of the oval – points on the necessity of the Transition. So, the cell of the united consciousness of humanity – is the Triumph of human consciousness, which had made the Transition, and continues life after the General resurrection. 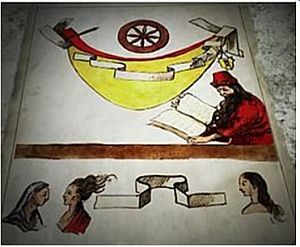 The absence of the Wheel of Time at the top of the picture indicates that this drawing transmits additional information and enhances the idea transferred by the main pictures of Nostradamus. The Ox – the date of birth. The Bull staying on his hind legs and facing the Woman is depicted in unreal pose for the animal. This way is shown zodiac sign the Ox – the year of the Woman’ birth. The picture 69. The Sagittarius and the Woman also points the same year of birth of the Woman – the year of the Ox. The Ox and the crescent of the united consciousness. Horns of the Ox in the picture 25 in the form of a crescent – the main symbol of the united consciousness, as well as several crescents of the united consciousness in the picture 69, highlight the mission of the Woman – to transfer to humanity the information about the necessity of unification of consciousness for the Transition and continuation of life. Thus, the picture 25. The Woman in the tiara and the Ox is a connecting link between already considered pictures informing about the Woman – the direct descendant of King David and the Woman in tiara that is presented many pictures of Nostradamus. Woman in tiara received the real keys to the kingdom of heaven instead of symbolic. The Woman – the central figure of Nostradamus picture 25– is shown with a three-tiered tiara. This means that this person has the keys received from the Above to the kingdom of heaven. As it is known, the papal tiara and red cape together with the keys to the kingdom of heaven are the emblem and symbol of the power of the Papacy. The papal tiara on the Woman’ head informs that she received from the Above the two real keys to the kingdom of heaven instead of symbolic, which were given to the apostle Peter, who based the institution of the papacy and was the first Pope. So, before the beginning of global cataclysms the symbolic keys from the Above have been replaced by the real keys for reading the Instructions for the Transition, written in symbols of consciousness. The real keys to the kingdom of heaven, presented by the symbols of consciousness, are depicted in many drawings of Nostradamus. The doctrine about the Transition, as the only way of salvation – is a new religion based on the unification of consciousness of civilization and the Golden Rule or ethic of reciprocity – Love your neighbor as yourself. United hands of the Woman indicate the unification of consciousness. The Woman stays on the ground showing, thereby, that she is a real person living on earth. Thus, the Woman in clothes of the priest with tiara on her head and united hands on the breast informs that she carries in the world a new religion based on the unification of consciousness and the golden rule of morality. Tiara – is a triple crown of the Pope, the high egg-shaped headdress, topped with a small cross and three crowns and two long ribbons behind. All elements of the tiara – three levels of the crown, a small ball or a cross on top, egg-shaped form, the two long ribbons behind, a horizontal row of rectangles and fringe, as well as a variety of ornaments consist of symbols of consciousness and reveal the basic principles of the united consciousness. Two people in the crowns – are drawings-outs with additional information. This way Nostradamus showed King David and his direct descendant – the Woman in the form of two portrait images at the level of the head of the Woman with tiara – of the same Woman, only already in life. The Man on the right with dark green collar of grass and earth color – is King David. Dark green collar, as well as his image at the top, that is hanging in the air, and not tied to the ground, shows that this man had lived a very long time ago. The Woman to his left is the direct descendant of King David, who will appear in certain time. Thus, the Man on the right belongs to the past, and the Woman belongs to the future. This is indicated by the absence of wide collar of dark green grass and earth color, but only the contour line of the same color in this place. Consequently, at the time of Nostradamus the Woman has not lived yet, and this is only information that she will live. Two Crowns with symbols of consciousness. The crown on the head of King David points out that he is the king. This crown has a thin base, shown by additional parallel line, as well as one element of the ornament in the center. The crown on the head of the Woman has a thin base; this means that she is not the queen by origin. Crown on her head means that the Woman transfers the information about the highest level of consciousness – the united consciousness of humanity. Small circles on both crowns represent small brain areas of individual cells. Located between them the circle of larger diameter depicts the expanded brain area of the cell of the united consciousness. This way is shown, the Principle of the united consciousness. Furthermore, on the crown of the Woman are placed five circles on the vertical teeth of the crown and one circle on the recurved tooth. Number five means the fifth level of consciousness – the united consciousness, and the number six points on carbon nature of humanity. On the crown of King David only four circles are shown on the vertical teeth of the crown and two – on the bent teeth. Number four means the fourth level of individual consciousness of mankind, and number two – the pair of people as the basis of united consciousness. Consequently, by number of circles and their location is shown the main mode of work of humanity’ consciousness in the period of the creation of the Psalms of King David, and also at the final stage of the development of civilization – in the period preceding the Transition. In the first case – it is an individual mode of consciousness and the beginning of the united, and in the second case – it is the united regime of consciousness. The ornament on the crown of the Woman consists of three elements – two small circles and a central figure. Thus, two circles represent brain areas of two merging cells, and the figure in the center shows the expansion of the brain area at unification of consciousness and reveals the Principle of the united consciousness. The ornament on the crown of King David is presented in the form of heart and consists of two brain areas of individual cells, which unite consciousness and connecting them a pointed oval of dematerialization and the Transition. Consequently, the same Woman depicted in the drawings of Nostradamus as with tiara on her head, and without it, on the one hand, reveals the complete detailed information about the beginning of global cataclysms. On the other hand, the Instructions received by the Woman from the Above and the two keys for their reading, will help humanity to understand the only way for salvation given from the Above and to make the Transition to the Highest level of the material world for continuation of life. The beginning of a new era. It has long been known that King David will have the direct descendant, who will mark the arrival of a new era, when the war will stop, will come the world peace, and all the people will be able to do the spiritual perfection. However, nothing was known nor about the reasons for the start of a new era, nor about the person. Nostradamus in his drawings reveals information about both – the upcoming events that will lead to the beginning of new era, and about this person. Nostradamus informs that the direct descendant of King David – is the Woman who received from the Above the Instructions for the Transition on the Highest level of the material world, written in symbols of consciousness, as well as the two keys for their reading. Her mission – is to warn civilization about the occurrence of global cataclysms of the planet’ destruction, as well as to transfer to humanity proposed from the Above the only way for salvation – the Transition to the safe Highest level of the material world through the unification of consciousness into the new cycle of life. This doctrine of the Transition is based on the unification of consciousness of civilization and on so-called the Golden Rule or ethic of reciprocity – Love your neighbor as yourself. It turned out that the moment of occurrence of the direct descendant of King David – is the time of the beginning of global cataclysms of incredible strength of the planet’ destruction. And humanity will go through the first of three preliminary cataclysms which occur on the planet during one year before the start of global cataclysms. This first pre-cataclysm will cover a huge territory and a lot of people will die. It will destroy many nuclear power plants, and on the planet will arise high level of radiation – people will not be able to eat anything. A new era of human life – the era of peace and mutual understanding will start immediately after this cataclysm. Just in this period of life humanity will finally realize the world not fragmented and disunited, but as single entity. After going through the first preliminary cataclysm of incredible strength and its consequences, and also realizing that, just in a few months will happen the second blow – more powerful and destructive, after which mankind will not have any chance to continue life – the whole civilization of Earth will consciously make the choice that was offered from the Above, as the only way of life salvation.